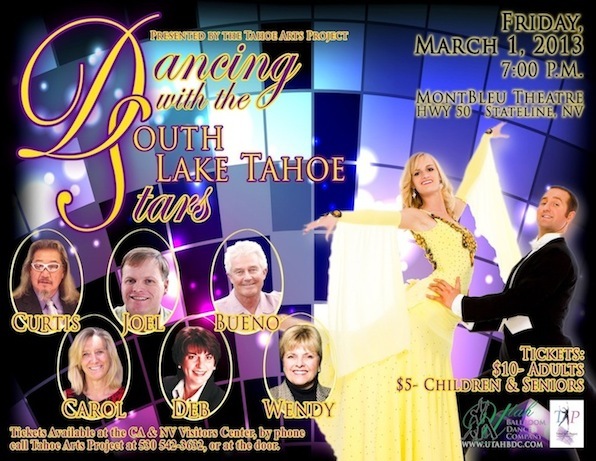 Tahoe Arts Project is pleased to present the Utah Ballroom Dance Company on Friday, March 1 at 7:00 pm at the MontBleu Theater. Ballroom dance is taking our nation by storm and re-igniting a passion for this electrifying style of dance. 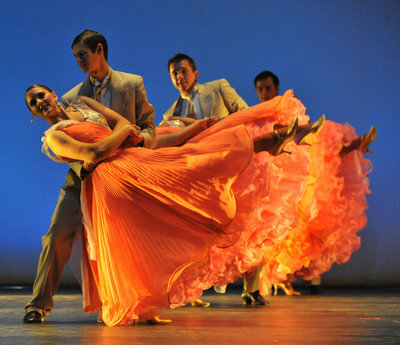 Thrilling audiences worldwide through this unique form of dance is the Utah Ballroom Dance Company. This company, which features some of nation’s top ballroom dance athletes has performed nationally and internationally receiving numerous accolades and awards such as the coveted U.S. National Formation Championships. Master of Ceremonies for the evening will be Dreu Murin, from KTHO radio. Twenty of the best dancers in the industry will be here to perform numerous styles of ballroom dance including the Viennese Waltz, Swing, Tango, Cha Cha, Paso Doble, Samba, Foxtrot, Rumba, Mambo, Quickstep, Charleston and the Hustle. Included is this very special evening, six members of the community will be participating in Dancing with YOUR Stars! Carol Chaplin, Executive Director of the Lake Tahoe Visitors Authority, Joel Dameral, South Tahoe High School Teacher, Wendy David, Lake Tahoe Unified School District Board Member, Curtis Fong, President/CEO of TGFT Productions / Bike the West, Deb Howard, Deb Howard and Company Realtors and Bueno Ketelsen, owner of Bert’s Café have all agreed to be the dancing stars! Similar to the popular TV show, they will be paired up with one of the professionals to learn a ballroom dance routine and complete with costumes they will perform their dance and our distinguished judges will score them. Judges for the evening will be Marcia Sarosik, Pat Ronan and Paul Middlebrook. The final decision will be made by audience vote. Come out and cheer on your favorite dancer! This interactive production will be fun for all ages and truly allows the audience to be a part of the show. Don’t miss your opportunity to see this talented group of dancer on Friday, March 1 at 7:00 PM at the MontBleu Theater. Tickets are $10 for adults and $5 for children and seniors $10 and can be purchased in advance at the CA and NV Visitors Center. To charge tickets by phone, please call 530 542-3632. Tickets will also be available at the door. Utah Ballroom Dance Company will be performing their program, Simply Ballroom in the South Lake Tahoe Schools the week of February 25-March 1. For more information, please call Tahoe Arts Project at 530 542-3632. Tahoe Arts Project is a nonprofit organization dedicated to providing professional performing arts in the schools and community of South Lake Tahoe. Come watch some of your favorite locals tear up the stage with professional dancers and find out who has natural grace and who doesn’t! Tickets may be purchased in advance at the CA and NV Visitors Center. Please call (530)542-3632 for more information. The schedule for the school assemblies may be viewed HERE.